In the following video we will briefly introduce you to the most important functions of RYTE. You want to join the individual steps of an optimization? The step-by-step guide can be found here. Even in the free unlimited version, Ryte offers all the features that newcomers and small website operators need. No other provider offers a comparable free service package here. Right at the beginning you get a complete and professional onpage check of your website, which you can use to make all the optimizations to start with good results. All tools for content creation are also included and can be used to a limited extent - i.e. 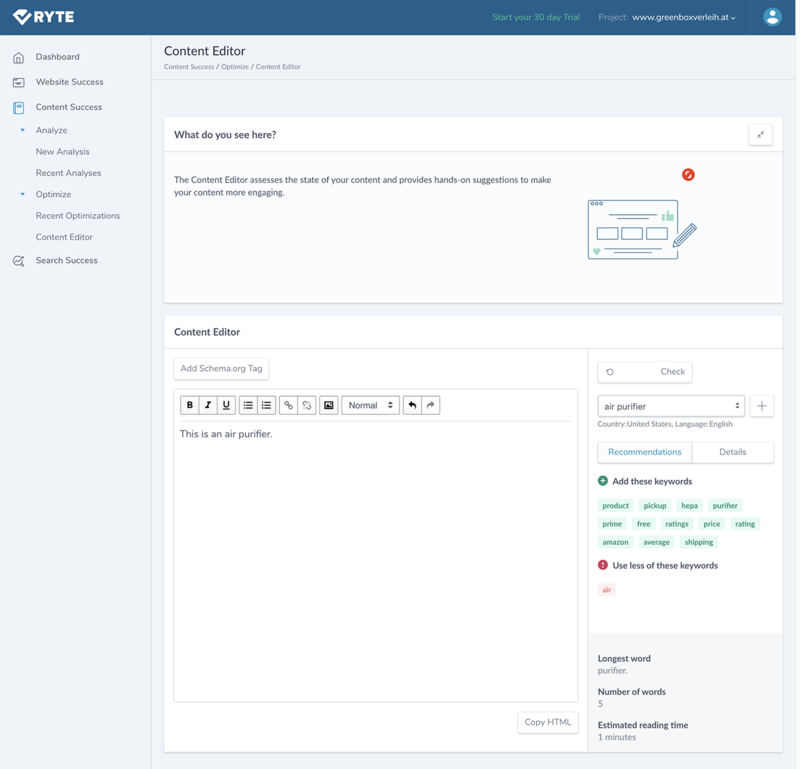 you get 10 Content Editor reports per month. The free version only offers one crawl per month - if you're in no hurry to check if the optimization you've done is okay, that's fine. Keyword rankings and monitoring are not included, but can be booked separately if needed. The integration of Google Search Console is only available in the paid packages. You can perform up to 5 single page analyzes per month - depending on the size of the website, this may be enough for operators of small sites. 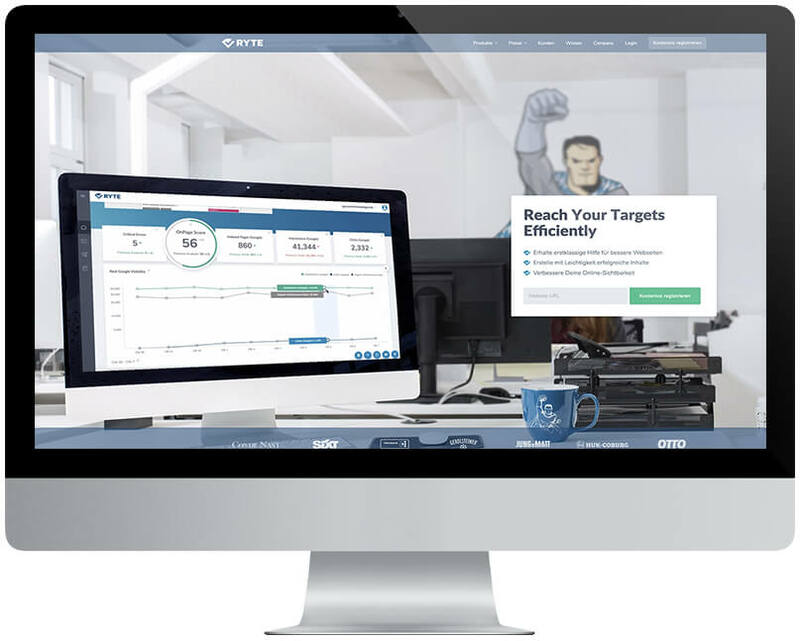 The paid version of RYTE unleashes its full potential. In addition to extensive monitoring get a professional SEO tool that covers all aspects of onpage optimization, success tracking as well as content creation tools. Even the smallest paid package already includes 3 projects with unlimited analyzes. With growing demand for projects, the packages can be gradually adjusted. Ryte is a reliable SEO tool, suitable for all user groups from beginners to agency level. For a fair price, a comprehensive product package is offered, which enables quick success and good rankings. Ryte have recently simplified their pricing structure. There are now the packages BASIC SUITE or BUSINESS SUITE to choose from. The functionality is the same, the packages differ mainly by the number of projects, the users and the testable URLs. In addition to a free and time-unlimited trial, there is the smallest package for the price of 99 EUR / month. By entering the URL of the page to be tested you get a quick overview of possible optimizations. After entering the URL, you will be shown an overview page with the analysis results for the corresponding page. The Website Checker provides a first overview of the status of the web project. Since this is only superficial, for further optimization either a free FREE account or a chargeable PRO account is recommended. The first step is to enter the domain to be optimized. 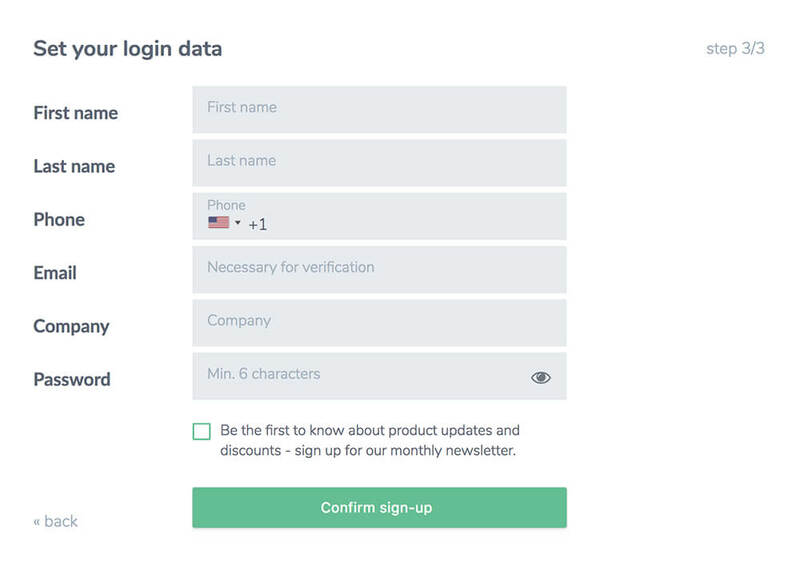 After a short query on the categorization of the website, you will be asked to enter some basic data. 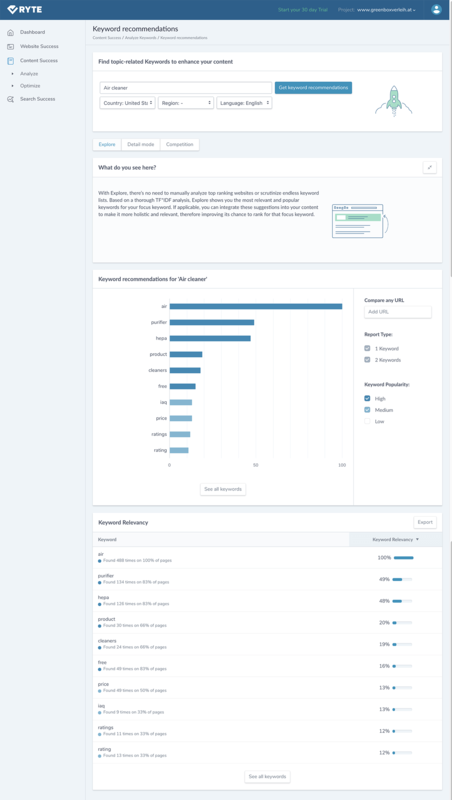 After logging in, the dashboard will be displayed, providing a clear overview for website optimization. Furthermore, the free version of Ryte is used to keep the optimization steps transparent for all user groups. When using the free version, you should start a crawl (analysis of the website) after implementing your first optimizations i.e. by using the TF*IDF tool, as you only have one crawl per month in this version and have to wait another month for the new crawl to review the effects of your changes. 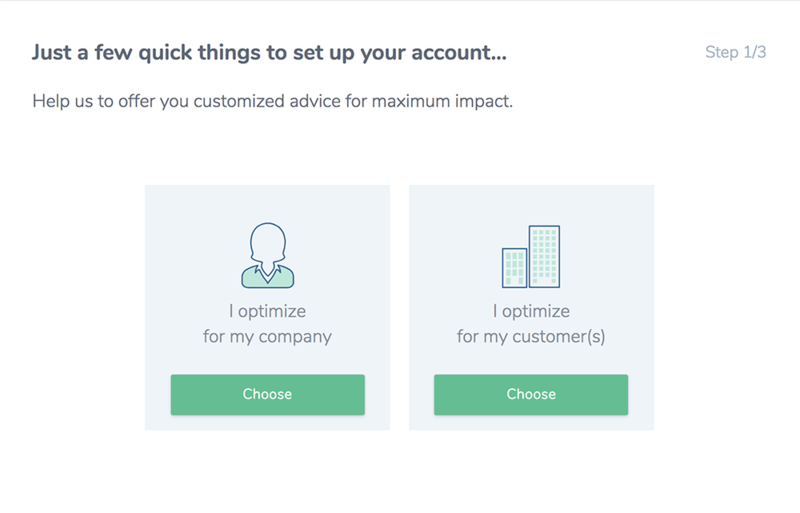 Before you start the crawl you can switch to the Content Success tool to write or optimize your texts. There, in the first step, you enter the desired keyword to be optimized for, as well as the geographic market (USA, UK, Australia, etc). 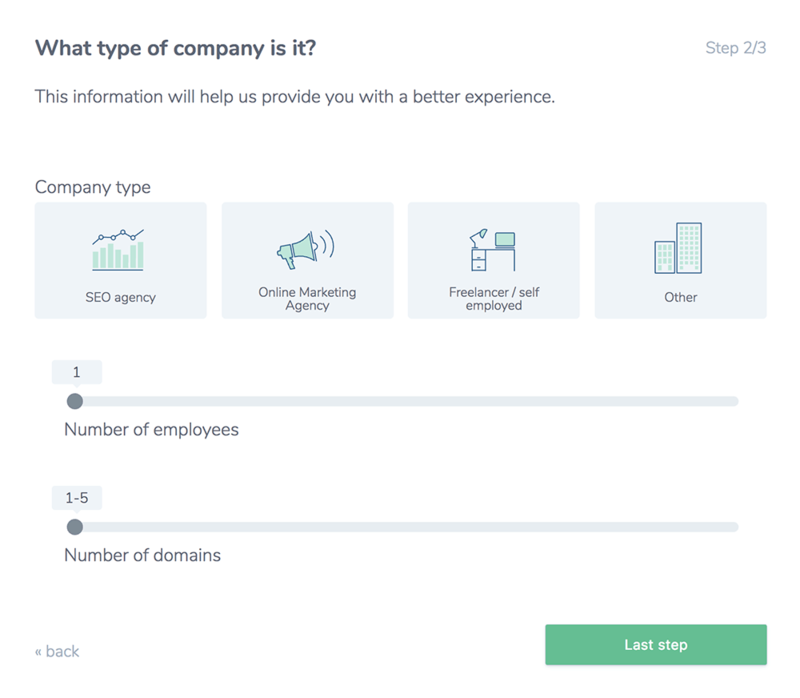 "Get keyword recommendations," will launch a TF*IDF analysis, displaying the most important keywords for your input, that should be included in your web page text, both thematically and with keywords. You have 5 free TF*IDF reports per month included in the RYTE FREE Account. In the example we search for these terms for the keyword "air cleaner". Below are the results. By clicking "GO TO OPTIMIZE" the CONTENT EDITOR starts. To check your website texts for completeness, simply copy your website text into the left text box. Then you define the keyword, country, region and language to which the text should be optimized. Clicking on "GET KEYWORD RECOMMENDATIONS" will display suggestions for keywords in the right box or will show which keywords have been used too often and therefore should be taken out of the text. The right box displays the keywords that should be added, removed, or used more often. With the CONTENT SUCCESS tool, you work your way up to the optimal content step by step and are ready to put your website to the test. After your text optimization is done, its time to switch to the WEBSITE SUCCESS Tool. There you start a website crawl (the analysis of the site for errors and optimization potential). As mentioned earlier, if possible, the crawl should be started as the last tool, as the free version only includes one crawl per month. By working through the other tools many errors have already been corrected and you can concentrate on the remaining errors and technical improvements. In the overview of the results you can see your current state of optimization. By clicking on one of the three items "STRUCTURE OPTIMIZATION", "CONTENT OPTIMIZATION" and "TECHNICAL OPTIMIZATION", the tool automatically scrolls to the corresponding location of the underlying error control list and shows any errors. By clicking on one of the errors, a detail page is opened, which deals more specifically with the problem. These errors should be corrected. With the left navigation bar you can now go through the individual items and correct all errors until the optimum is reached. If you do not know exactly if you've done your optimizations right and you do not want to wait a month for the free version to start the next crawl, you can start a single page analysis with the tool "SINGLE PAGE ANALYSIS" at the top the WEBSITE SUCCESS results to examine individual pages for errors and optimization potential (in the free version, the analysis of 5 pages per month is included). If you want to check more, you should switch to the paid version. 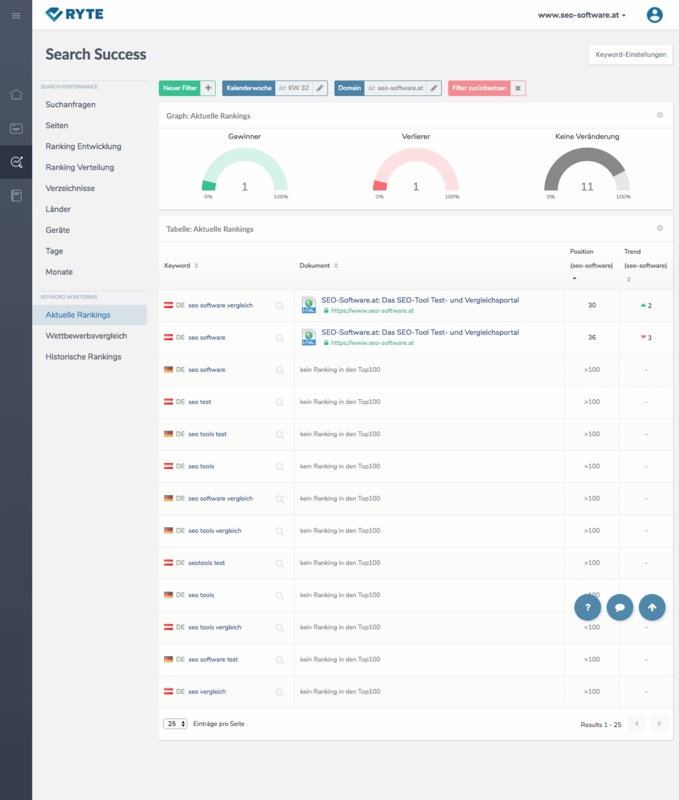 After entering the URL to be optimized, the tool starts the analysis and generates a detailed report. The report is roughly subdivided into ERRORS, WARNINGS, and INFO that should be cleaned up. After completing all the points, the basic optimization of the page is completed. 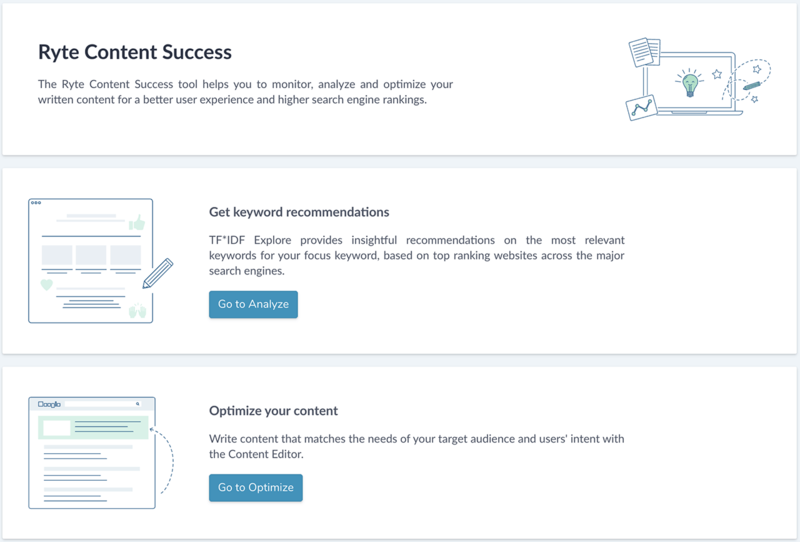 Finally, you can control the success of your optimization in the SEARCH SUCCESS Tool. In the free version, they are updated once a week. Based on these results, you can then set further steps or enter additional keywords in order to optimize them. 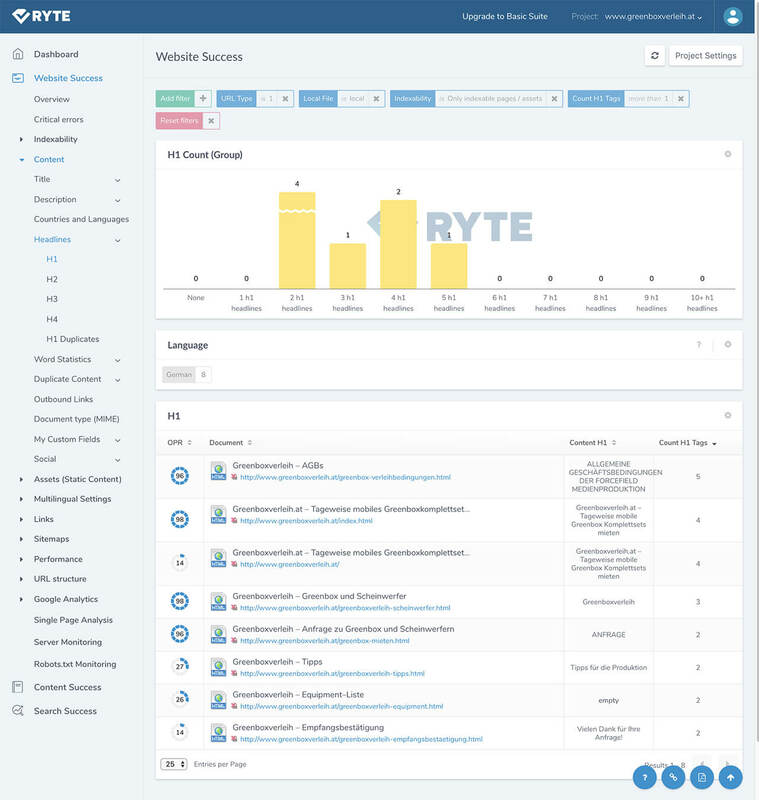 The paid version of RYTE includes unlimited crawls and all tools mentioned above including ongoing monitoring of your keywords and your server status (tool to control failures and timeouts of the website) as well as the possibility of linking RYTE with Google Webmaster Tools (Google Search Console ) to analyze the performance of impressions, clicks and rankings.